You want your big day to be flawless, and having your wedding dress ready to slip on without any surprises is a necessity. Use these helpful hints to make sure that your dress is perfect for your walk down the aisle. Every bride wants her wedding day to go off without a hitch. Unfortunately, that doesn’t always happen. From last-minute decor issues to floral arrangement snafus, there’s sure to be some issue in the 24 hours before the big event. There’s one thing that should be absolutely perfect, though: the dress. Here are a few tips to make sure that your dress is flawless on your big day. To ensure that your dress is appropriately fitted, your dress may need alterations. A few minor nips and tucks is often the difference between a perfectly fitted bodice and spending your wedding day worried that your top will fall down. 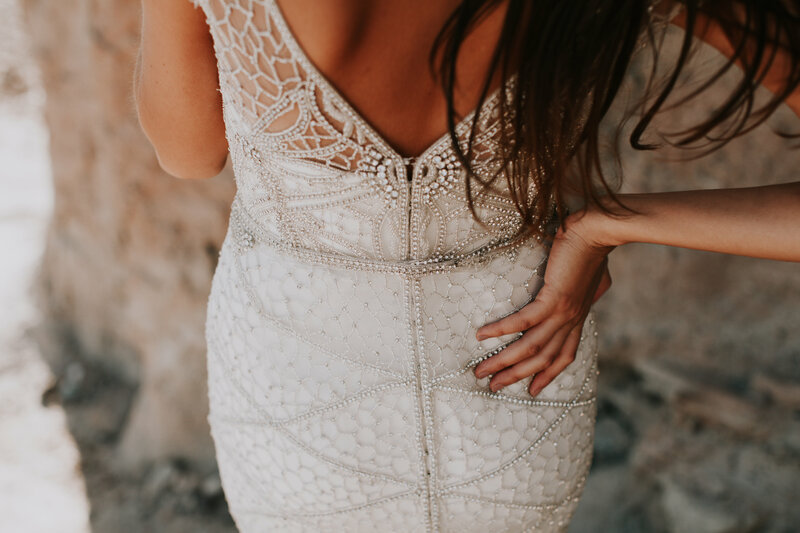 If you’re purchasing your dress from one of the bridal stores in Columbus, the boutique will likely make the necessary alterations for you. If you’re buying your dress online or at a sample sale, you may need to take your dress to a tailor to achieve the ideal fit. Allow several months for high-quality alterations. Your wedding dress is almost certainly the most expensive garment you own. That means you can’t just shove it in your closet with the rest of your dresses. It needs to be stored correctly so that it looks its best on your big day. First, only use padded hangers. Cheap hangers can stretch out the fabric before you even get a chance to wear it. Second, don’t jam it between other garments. There should be at least a foot of empty space on either side. Third, keep it covered. Plastic garment bags can lead to mildew or discoloration. Instead, choose a porous material like cotton, which will keep dust off the fabric without leading to any unwanted mustiness. Sometimes a last-minute stain is unavoidable. If you get a bit of makeup on your sleeve, don’t fret. Bring a package of stain removing wipes with you to the wedding venue, as they can get rid of almost any stain. Just make sure you address the stain quickly, as they are harder to remove the longer they’re allowed to set.